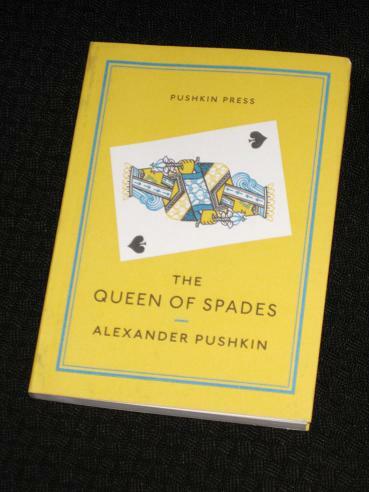 ‘The Queen of Spades’ itself is a longish short story set in St. Petersburg. It tells of an officer who hears a story about a countess who knows the secret of successful gambling. He decides to get the secret from her, by fair means or foul, faking an attachment with the countess’ young ward in order to get closer to the old lady. Eventually, he does learn the secret – but can he really trust the mischievous old woman? This casual and humorous style contrasts nicely with the darker turn the story eventually takes. However, Pushkin is far more famous for his poetry, and this is where the main interest of the collection lies. One of the most famous poems in Russian (and one, I suspect, that many people memorise at school) is ‘The Bronze Horseman’, a twenty-page ode to St. Petersburg. The poem starts with the story of the city’s founding in the Finnish swamps and goes on to describe the city’s beauties. Then we are told of a (real-life) flood, one which devastates parts of the city – and has a dramatic effect on the life of Yevgeny, a poor working man. To round off the collection, there are ten or so shorter poems, representative of the hundreds Pushkin wrote. They read elegantly and smoothly – at which point it is probably time to praise Briggs and his excellent translation. In addition to writing an interesting introduction (and supplying occasional footnotes), the translator has managed to create a collection of different forms and styles without sounding artificial. I have no knowledge of Russian, but poetry is notoriously tricky to coax into a foreign language; my enjoyment of the English versions must surely reflect on the translator’s skill. Whipping Winds and scurrying snow. Babies wailing – blow, winds, blow! It is clear from this stanza that Briggs is attempting to keep the alliteration and rhythm of the original (‘whipping winds’, ‘baying beasts’, ‘threadbare thatch’), and this comes though very well in the fourth line, where the b/w/b/w/b pattern can’t have been easy to create! Interesting mention of a phenomena I knew from my youth: Russia, one of the world’s largest nations & culture of people, behind the Cold War’s iron curtain, was nigh excluded from older European education. In context here I appreciated the review, but found it a bit low on the main story itself. Splendid though the examples of how the translator invested effort to stay true to the original works.